Nothing in the world beats being a dad to daughters; no one loves you like your daughter does. Your mother thinks you could have done a bit better, your wife is all too aware of the faults she puts up with, and your sister may forgive, but won’t forget the years of childhood antagonism. But to your daughter you are a heroic amalgam of Super Man, Bob the Builder and Bagpuss. She will believe you are awesome until you overwhelm her with evidence to the contrary, so you owe it to her to be awesome. That’s not to say being dad is easy. Daughters have their own super power, which is getting you to do what they want. From the moment you first pick them up wrapped up in a hospital blanket you can give up any pretence of free will. They know from the cradle that you are utterly subservient to their whims, which makes being a parent very tricky. So here are a few tips and tricks I have picked up along the way, trained in the school of two daughters, now ten and eight. 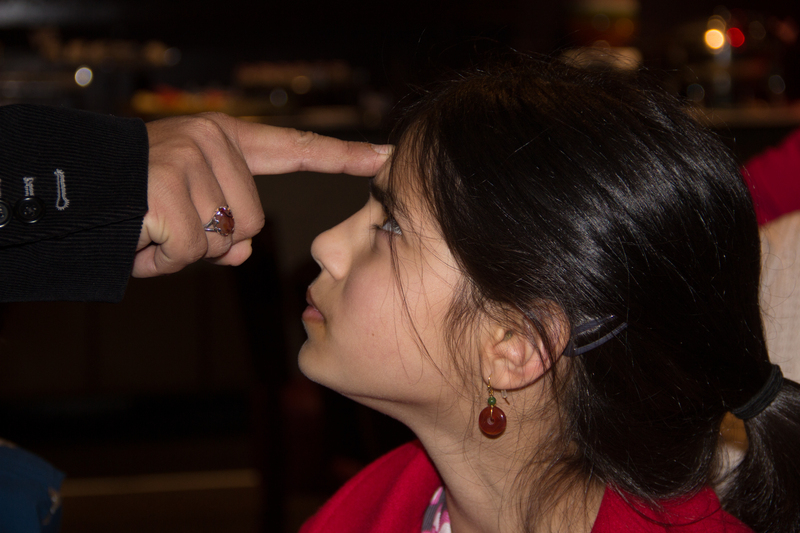 Daughters are born with the knowledge of how to make the big eyes at you. It does not work on mum because she did the same thing to her dad. But for you the big eyes are kryptonite. You are helpless before their power, and the only way to protect yourself is to not make eye contact. Those are all the cues you will get. Do not look away from the football. Do not risk your peripheral vision. Right now she is making the big eyes at you and is about to ask for the thing her mother has just denied her. Turning to face her now is like opening the lead lined box with the glowing green crystals, your dad powers will be lost. Look into those eyes and you will be in a quagmire of submission to daughter and going against the express wishes of your wife. Look at her and you have lost. If you have made it this far then it is time to go to tip 2. You never, ever, say mum is wrong about anything. That way lies complete chaos. As with many things that involve women, of whatever size and relation to you, the rules are unbalanced. Your wife is free to tell her daughter that you are wrong about all sorts of things, although in fairness this is usually about what they are wearing, and whether it needs to be ironed. TBH objects to me letting the girls dress like Cyndi Lauper. Apparently clothes have to match, hair needs to not only be detangled, but brushed into a style. I’ve given up pretending that I understand. There are of course some things in which you are the expert: Cruyff turns and the offside rule are two obvious examples. It’s the 21st century, teach your daughter these. For everything else Mum Knows Best. When you go out they will wear jewellery, frequently plastic and brightly coloured, and sun glasses, and they will want to carry a handbag. You’ll be at a theme park, and they will need to divest themselves of all this gear to go on a ride. Mum’s handbag will be full with useful and unmentionable things. Your pockets will have all the accoutrements of male life – wallet, phone, keys, knuckle dusters etc. At this stage your only option will be to wear the accessories. You may have thought you looked cool and manly, but all that is worth nothing. You will be adorned with bracelets and necklaces, glitter laden sunglasses will hang from your shirt, you will be carrying a woven handbag with a big flower on it. If you want to be dad these are the table stakes. Easier to bear, but harder to accomplish is the carrying. She will get tired, you will have to lift her. This may last for a considerable amount of her life, and a considerable amount of time each time you have to do it. When it comes to carrying I recommend seating her on your shoulders. Most importantly this means you can go on for longer, as your arms will not get tired. Your arms will also be free to do other manly stuff: paying for things, carrying bags, fighting ninjas and the like. There is a plus side, you will be her hero, and you will look heroic doing it. I had strangers taking pictures of the younger one sleeping with her chin on my head all through the queue for the cable car at Genting Highlands. You also stack up loads of parenting credit, and can delegate all parenting activity from then til the next day because of all the hard work you put in. Mum will want her to be demure and genteel and a proper little lady, but she is still a kid and kids of any gender love fart and snot jokes. One of my kids’ favourite stories is of a little boy who hides in a tree and gives away his location by farting. So why would you give away a guaranteed laugh from your armoury of keeping the kids amused? It goes beyond fart jokes, she may not be a boy, but while she is little you can wrestle and roughhouse with her. TBH complains “Be gentle, they’re girls.” But I don’t buy that, tickle fights and tossing them up in the air, and hoisting them over my shoulder are all part of the repertoire. There will be times when she is grumpy, or upset, or sleepy, or not sleepy or any of a dozen different moods. You need a range of techniques to have at your fingertips to lift her out of it. My younger one is a simple creature, you can deal with most things by picking her up and giving her a cuddle, but the elder altogether more complicated animal. Something as simple as waking her up can require two or three different approaches. She loves stories, so telling her a story on the assumption she is listening is a favourite, she wakes into the story and after a while can’t resist asking a question or offering an embellishment. We also have a wake up song, and the rule is that once the wake up song has been sung she has to get up. The classic conundrum is what to do when you hear the dreaded “I’m bored”. For mine stories are again the key, and now they are a little older I just need to start them off and then they make up the rest of the story on their own. In fact the elder one, inspired by Avatar has made up her own world of the Sky people and Star people and goodness knows what else, and she can be distracted quite easily by asking for the next installment of her own creation. The point is quite a simple one, you need to know your daughter and develop the tools, so that she learns the response by instinct: when she hears a story she embellishes, when she hears a song she gets out of bed before mum starts scolding. Of course she will be as strong willed as her mother, and there will be times when you need to separate madame and little madame, and if she is in a state of high dudgeon all the stories and songs and nose kisses in the world may not bring her down. Be prepared to just hold on, sometimes all you’ve got is to pick her up and say “I’m here and I ain’t going anywhere.” Unless of course it is time to pull out “the magic”. The Magic is the go to move to end them all. I get it Padawan. Sometimes all the “there is no try” or “fear the path to the darkside is” doesn’t cut it. Yoda just has to lift the damn X Wing out of the swamp. When she has morphed into stropolopogous you need to break the cycle of the “little me” narrative in her head, where everyone is against her. She’s in the swamp, get lifting. The Magic is a trick. Hold your breath. Say “gooble boolie”. Breathe out. That’s it. Tell her it is impossible to do this and not smile, and everytime she does it she will smile. You can replace the phrase with any other nonsense sounds that work in your linguistic / cultural context (and if gooble boolie is a profanity in your patois I refer you to no.3). I have it to the point now when I can just say “Take a deep breath…” and she know what is coming and smile. Or I can pretend to forget the magic words, and we play at trying to remember the right formula. By that stage you are in, there is a chink in the tantrum armour, and you can begin the slow process of de-escalation. There will come a time when carrying them around is no longer possible and telling them silly stories isn’t cool. Be the superhero while you can, and show them what it means to be loved. One day someone will come along looking to take first place in their heart, and if you can’t fill the suitor full of buckshot you can at least make sure your daughter has grown up so surrounded by love that she isn’t dazzled by the first guy to take an interest. Your son is your son til he takes a wife, your daughter is your daughter for life. You can’t give her any guarantees, life ain’t like that, but you can be Jedi Dad. There is no try. If you are interested in my storytelling look here. I’ve been out of luck with mirrors recently. First there was the mystery of the mirror in our bedroom, fitted flush to the wall and leaving me baffled. The folks who owned our house previously had seven daughters, a veritable deluge of God’s mercy. It may be relevant to mention at this stage they were Plymouth Brethren. Anyway in a house that boasted two bathrooms and a downstairs WC you can understand why the parents of these seven wonders wanted a shower, sink, mirror and shaving light in their bedroom. We decommissioned the shower, it always seemed a bit weird and my shirts needed the hanging space. The sink stayed as a small dust trap until we had that removed too, which left the mirror and the shaving light. TBH asked me to replace the mirror with a full length one, and that’s how you find me standing in front of it with screwdrivers and a bolster, in a state of confusion. I’d taken down the tiles, stripped the silicone, removed the light and still the mirror would not move. My reflection mocked me as I pressed and tugged and shimmied, cursing the over zealous fool that had recessed the fittings. 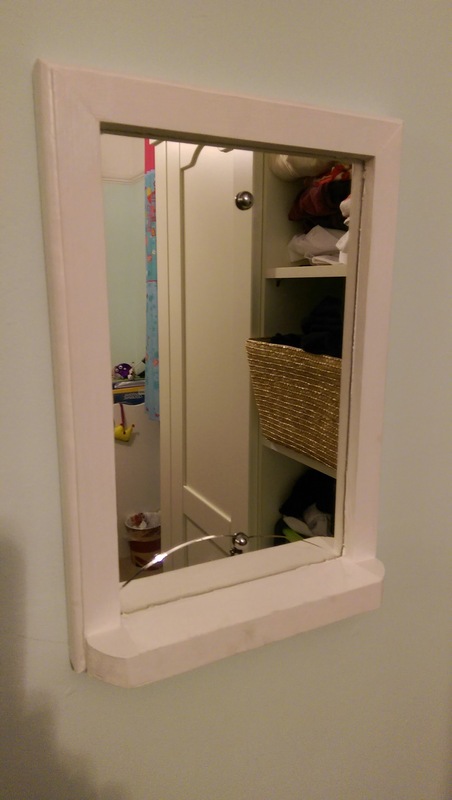 The new mirror is an IKEA job with fittings you can see. It slides out because one day someone won’t want a mirror there. This is called foresight. There is one other mirror in the house that I now realise to be glued. I think the right way to remove them is with garroting wire. Understandably this is not something you can buy on the high street. When we redo that bathroom I may have to hire an assassin to get it down for me, but let’s not go borrowing trouble just now. The other mirror disaster was in Bob’s room (pictured above). I recycled another inherited mirror from the previous owners into a specially made frame. Rebated, routed edges, mitred corners, I felt like a true disciple of Norm Abram. The top screw went in just fine, the lower one I overtightened by a bare fraction and CLICK. The mirror crack’d from side to side. “Shhh…” I stopped myself from saying as both Bob and Bill were there to “help”. Hours in the workshop wasted. I was devastated, I’d made this thing for Bob and it was ruined. She’s a good kid, she’s perched her collection of lip balms on the little shelf to hide the worst of the damage. Maybe the mirror can stay as a permanent addition to the room, and I guess my two mouthy gorgeous doses of God’s mercy are just plenty. So God in his mercy lend them grace, as uncle Alfred almost wrote, and they can check it in the mirror. BTW we have found nothing untoward behind any of the mirrors, unlike here.